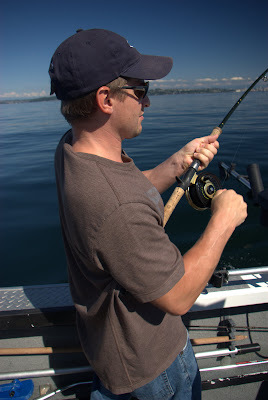 Keith and I played hooky today and went fishing on the Puget Sound. 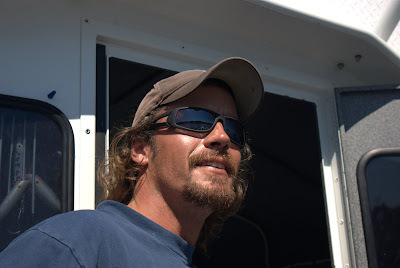 It was a fishing trip I "gave" him for his birthday a year and a half back, and we finally got around to scheduling it. We're both kind of lame that way. 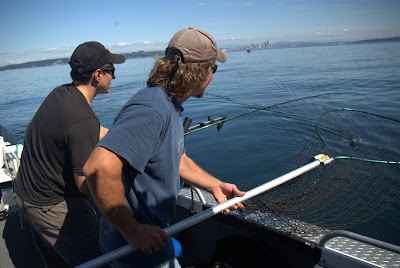 But the weather today was the sort that has fooled any number of unwary visitors into moving to Seattle after a short summer visit: gorgeous blue sky, perfectly calm water, mountains everywhere you looked – and a fish on the line every few minutes. 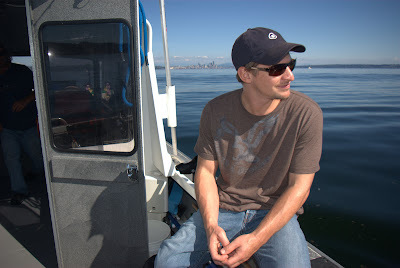 Matt McCulloch, the owner and principal guide of Tyee Charters, was perfect: he swore just enough to be interesting, knew exactly where the fish were and how to get them, and understood a lot more about Internet marketing than I expected. When we weren't talking about the best depth to run our lures, we were talking about SEO and AdSense. Turns out that small business owners use the Internet to market themselves. Who knew? 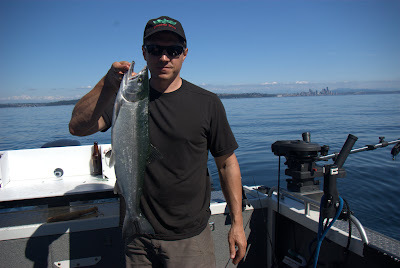 We only took two fish home, but we pulled a lot more up to the boat: either they were too small to keep, or they were Kings and hence out of season. But it was as good a day fishing as I've had, and I recommend it.